Several times each year the Apprentice makes the trip to San Diego to hang out, eat fish tacos, and escape from the New England weather. On this trip back to San Diego, he brought with him stories of his trip to Uganda and a new street food he ate while he was there, the rolex. The rolex, as you can see, is a rolled up snack much like a burrito that is filled with a mixture of eggs and assorted vegetables. 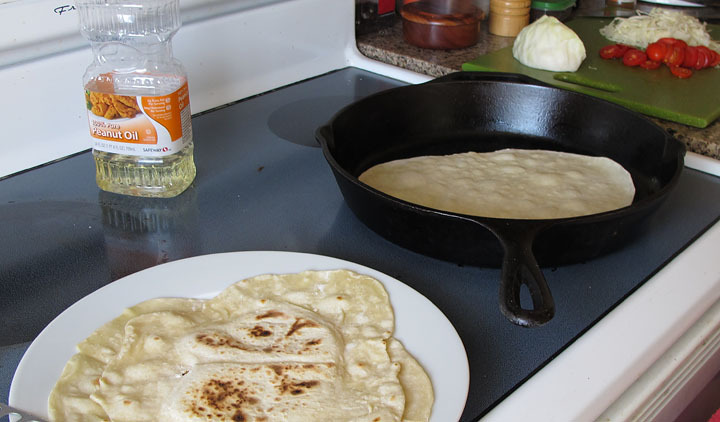 The wrapper is made of a thinly rolled, skillet cooked wheat bread called a chapati. The eggs are mixed with tomatoes, shredded cabbage, salt, and cooked much like an omelette. The whole thing is then flipped over, the bread is put on top to steam a little bit, and then flipped again. At this point, the cooking is completed and the concoction is rolled up, burrito-style, and served immediately. If you want the true street-food experience, the rolex is rolled tightly in newspaper for easy transport. Break eggs into small bowl. Add cabbage, tomatoes, and salt, and mix with a fork until combined. Add a small amount of oil to the pan and make sure the pan is coated all over. Pour eggs into pan trying to keep the mixture in a circular shape. In a 12 inch pan, the eggs will not run all the way to the edges of the pan. 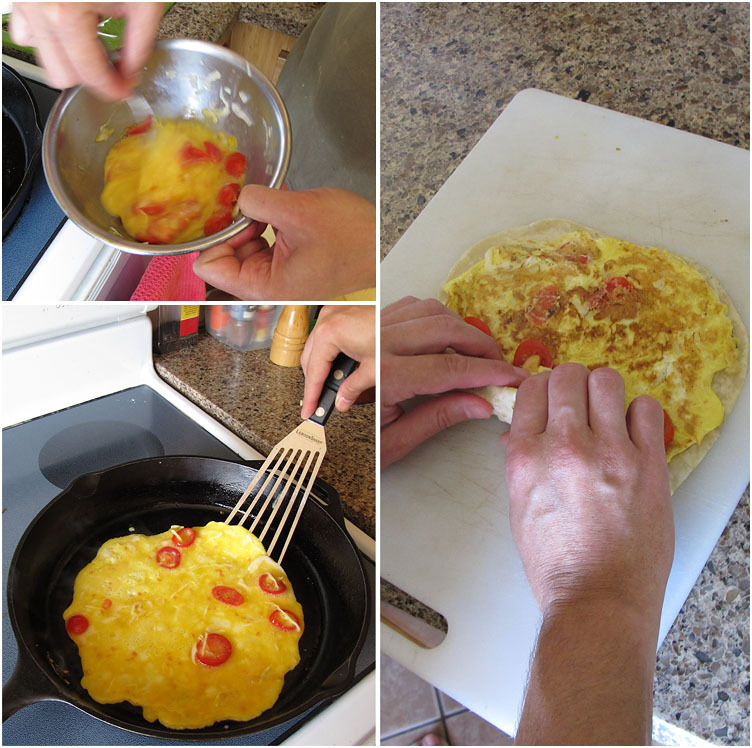 Place chapati over the top of the eggs while they continue to cook for one to two more minutes. Using the spatula on one side and your hand on the other, flip the whole thing onto a plate. 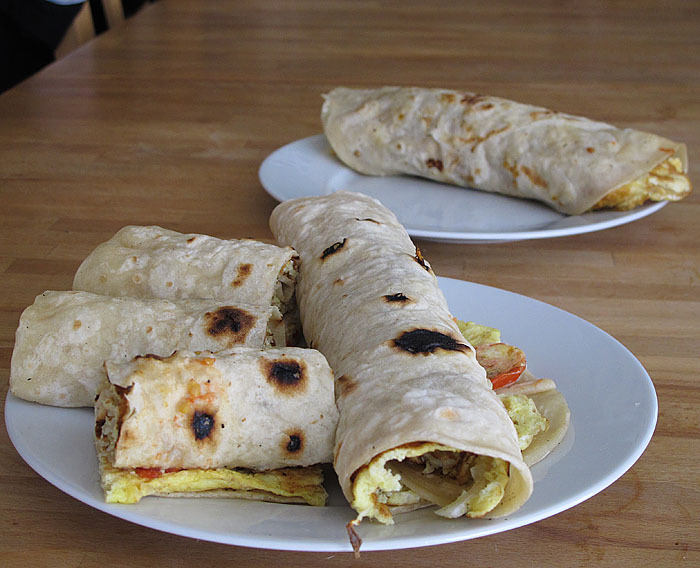 Roll the egg and chapati up, burrito-style, to complete your rolex. Looks great! Do they ever eat it with any kind of dip or sauce?